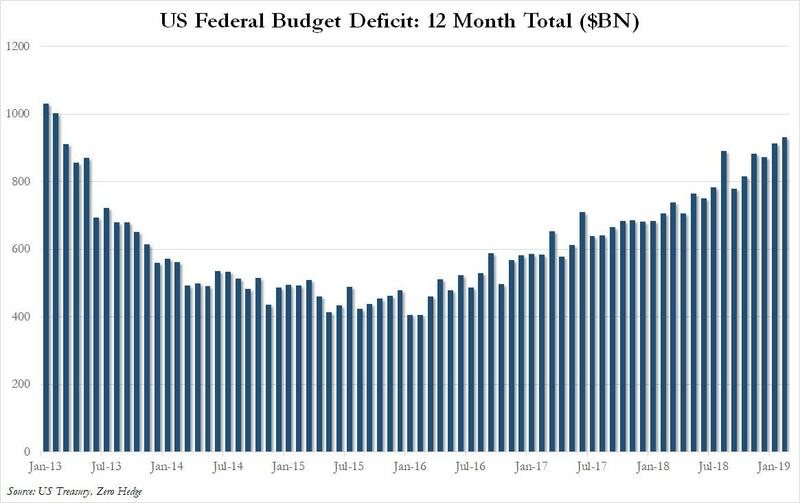 For March, receipts rose 7.5% y/y to $167.3BN while outlays rose 8.2% to $401.2BN in Feb. As a result, the budget deficit for the first five months of the fiscal year, widened to $544 billion, a whopping 39% higher than the $391 billion reported for the same period last year, largely the result of the revenue hit from Trump's tax cuts and the increase in government spending. The deficit was the result of a modest drop in fiscal YTD receipts to $1.278 trillion, while spending jumped 9% to $1.823 trillion. The jump in the deficit was despite the bump in customs duties, which almost doubled to about $29.5 billion this fiscal year from $15.3 billion a year ago, reflecting the Trump administration’s tariffs on Chinese imports. 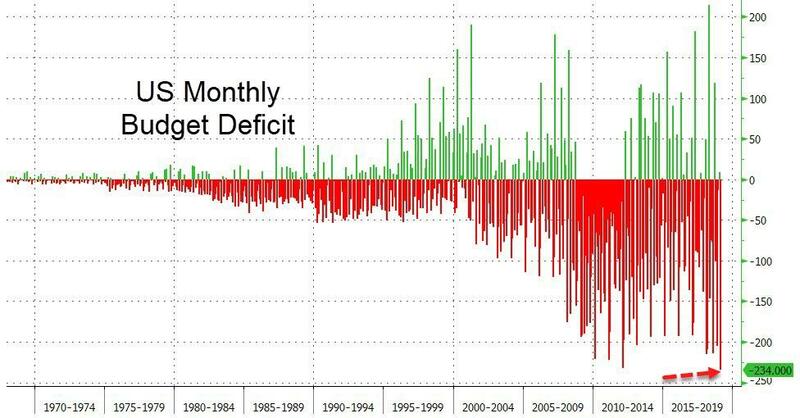 On a trailing 12 month basis, the defciit rose again, hitting $932 billion, the highest since February 2013, when it was just above $1 trillion. 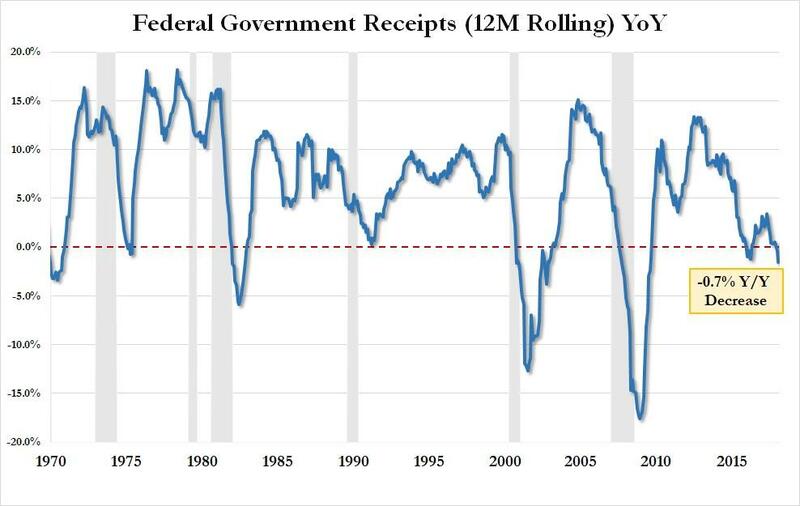 What was more concerning perhaps is that rolling 12 month receipts declined 0.7% Y/Y, after posting a 1.5% drop last month and now represents three consecutive months of declining receipts since March 2017. Worse, the absolute drop in tax receipts, which declined for both corporations and individuals, was the biggest since the financial crisis; and, as shown in the chart below, every time that receipts have posted an annual decline, a recession either followed shortly or had already arrived. 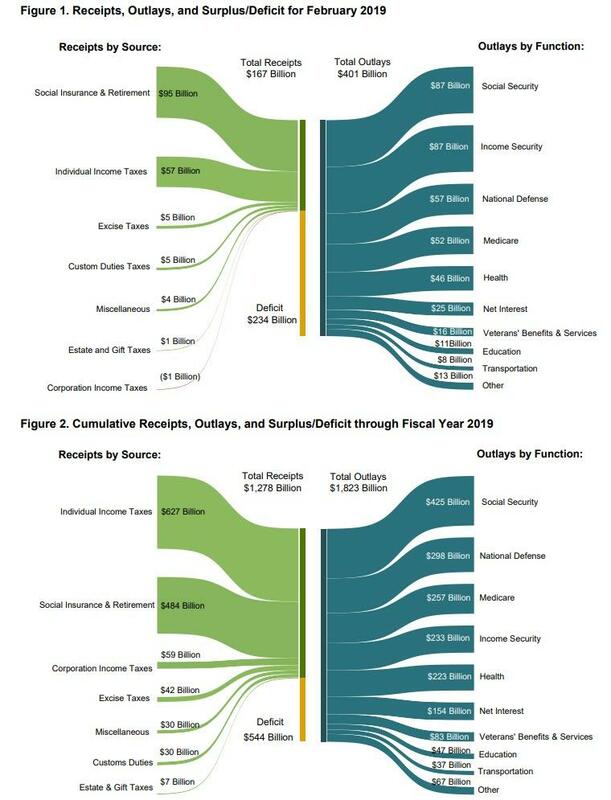 Unfortunately, since receipts are set to decline even more in the coming months, the overall budget deficit is set to widen further in the coming years as the Republican tax cut package and increased spending for defense and other priorities boost government outlays. Some policy makers and economists are flagging concern about the growing debt burden, saying it risks America’s credit quality among borrowers, while other economists see more room to run. According to the CBO, the budget deficit in fiscal 2019 will widen to $897 billion, up by $118 billion from a year earlier; any economic recession will result in a far greater number. 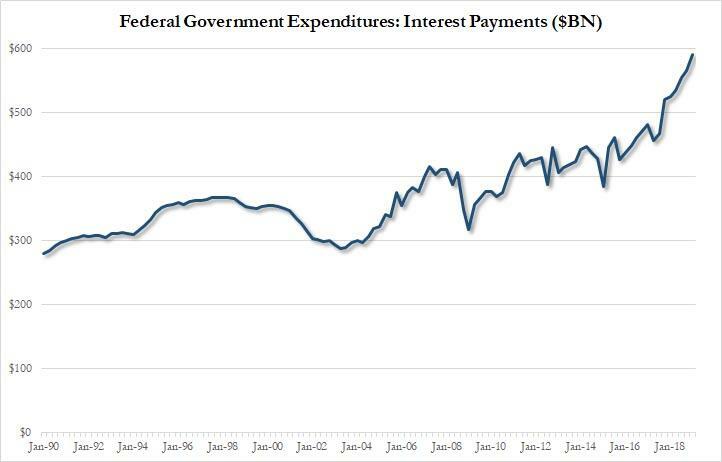 And since total debt, which recently surpassed $22 trillion is only set to keep rising - once the latest pesky debt ceiling issue is resolved in a few months - expect interest on the debt to keep rising, especially if inflation comes back with a bang and the Fed reverts to its tightening trajectory, and hit $1 trillion per year as soon as 2021, making it one of the biggest spending categories, and on pace to surpass total US defense spending (roughly $950BN per year) in dollar terms in just two years.